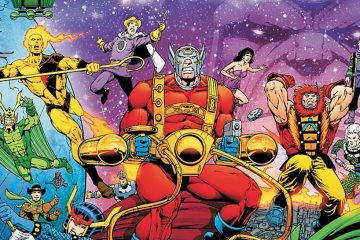 In so many of its iterations, the Justice League has been composed of the gods of the DC Universe, the powerhouses. In one version or another, the team has been composed of titans such as Superman, Wonder Woman, the Flash, Green Lantern. The idea is that those heroes act as inspiration to the people they protect. 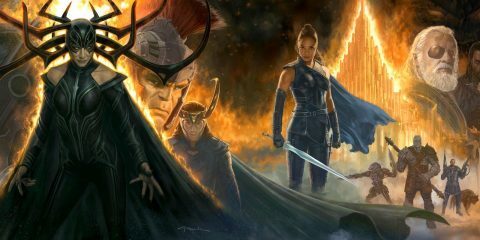 However, while this is a noble idea, there’s also the argument that those types of all-powerful characters, no matter how noble, are removed from connecting with the people under their protection. That inspiration is meaningless without showing them how to be heroes. Enter Justice League of America: Rebirth #1, on sale now from DC Comics. 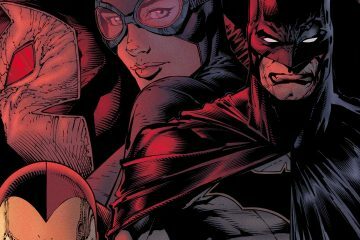 In the relaunch of the title (separate and apart from the still ongoing Justice League series), writer Steve Orlando and artist Ivan Reis run with that idea, having Batman assembling a team of heroes to work with the people, not above them. 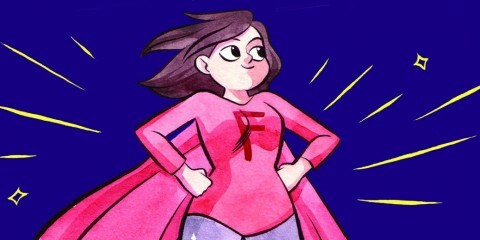 It’s a difference of aspirational versus inspirational, that we can all be more than we are. 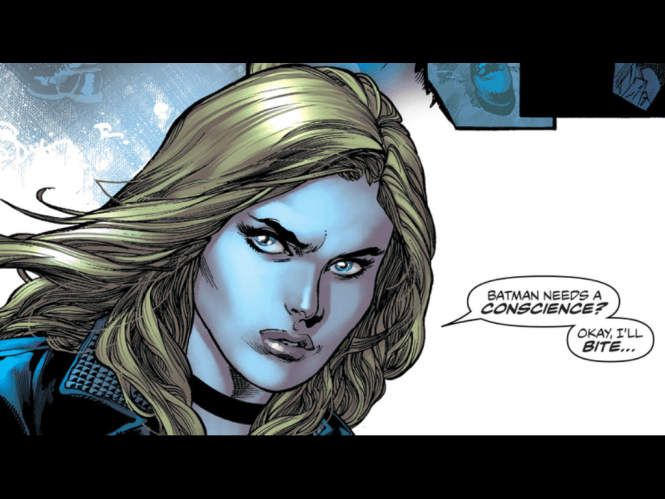 Nowhere is that highlighted more in JLA than with the inclusion of Killer Frost in the issue, who saved the day in the recent Justice League vs. Suicide Squad miniseries. Someone whose activities tended to veer on the wrong side of the law, Batman sees a chance for redemption in her. 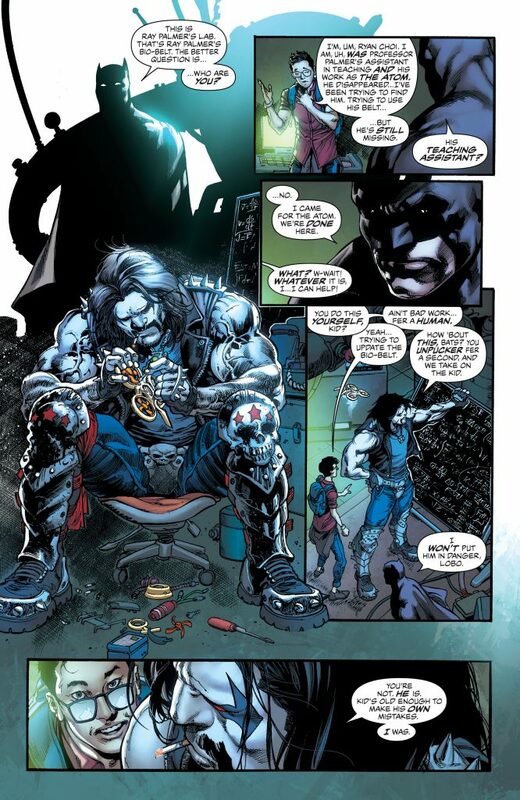 With the addition of Lobo as well, it wouldn’t be farfetched to think of the Dark Knight’s crew as the anti-Suicide Squad and a complete 180 from how Amanda Waller runs that team. Despite Batman’s grim persona, he’s a character who is hopeful at his core, which is why this characterization of Bruce is so spot-on. That’s why Orlando is so clearly a great fit for this book. It’s clear that he knows Batman and gets that fundamental truth about the Dark Knight’s character. The whole conceit of this JLA title seems to be built on hope and the essential idea that humans are basically good, if only they are shown the way. 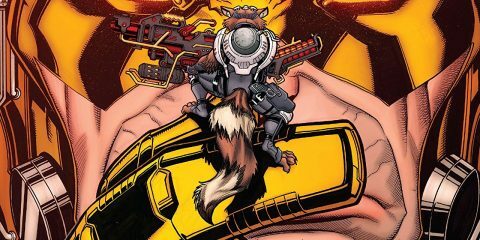 Bringing in characters like Vixen, The Ray, and The Atom, who are certainly heroes but don’t live above the people in a metaphorical Olympus, help to drive that point home. A note on diversity and representation. It’s clear Orlando wants to make a concerted effort in JLA #1 to include a diverse cast of characters in terms of background, ethnicity, gender, and sexual orientation. In a book that wants to make connecting to humanity on the ground level a key cornerstone of the narrative, this is expected and welcome. The cast is more reflective of the vast range of humanity that lives on the other side of the comics page. However, Orlando never makes it feel like he’s ticking off a list to include heroes that fill a certain quota. On the contrary: the main conceit of the issue still centers on the idea that this disparate group of people needs redemption or a home in the company of one another. It just so happens that the cast is more varied than we sometimes see in a lot of superhero fare (although, credit where it’s due, that’s been changing in recent years). And that’s such a blessing. 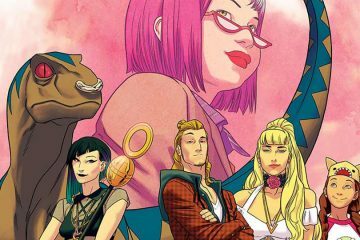 We see more and more how much representation in pop culture media matters: when someone sees a character like themselves featured in a four-colored comic book story, they’ll be more likely to connect to and engage with that yarn. They feel valued and recognized. When I read The Ray: Rebirth—also written by Orlando—and then learned he would be featured in this new Justice League series, I couldn’t help but think of LGBTQ readers, young and old alike, who would get to see an out gay young man featured in the League franchise, and it made me smile. And again, it feels organic. Orlando is a writer who takes great care in the characters he stewards in any comic he tackles. 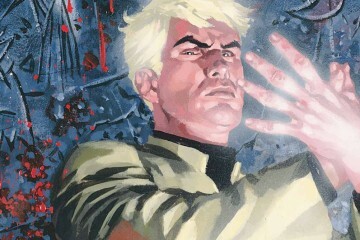 However, as with Midnighter and Apollo and now with his depiction of the Ray, he treats LGBTQ characters as well-rounded people, not sanitized of their sexuality, but also not fully defined by it. And that made my heart sing. Bringing Reis aboard as artist was a sharp choice and, really, a no-brainer. The artist knows these characters, having rendered them off and on for years. He knows how they react in different situations, their body language and how that reflects off other members of the cast—and, somehow, he can make a roundtable meeting feel dynamic and fresh. I’m looking forward to seeing what he’ll do with the action when Justice League of America #1 kicks off, as he’s a master of showing action in fresh and unique ways. In Justice League of America: Rebirth #1, Orlando and Reis have revealed their mission statement for the upcoming Justice League of America title, one that reflects the hope and diversity of the America part of the book’s name. Justice League of America: Rebirth #1, written by Steve Orlando with Ivan Reis on pencils, is on sale now from DC Comics. 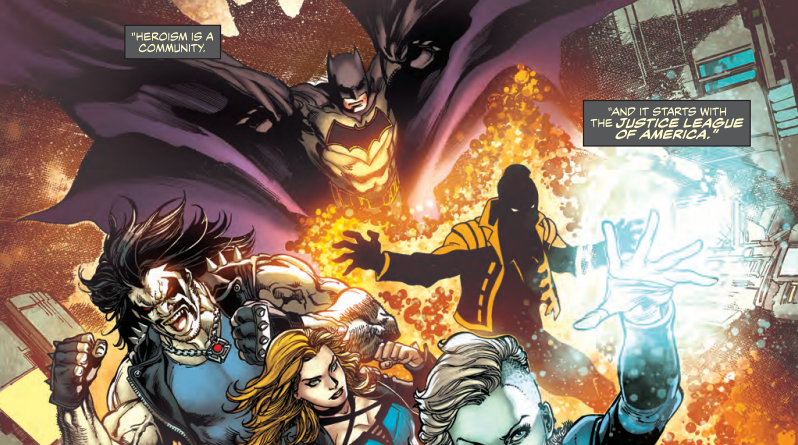 Batman, Black Canary, Killer Frost, the Ray, Vixen, the Atom, and…Lobo?! Spinning directly out of the events of JUSTICE LEAGUE VS. SUICIDE SQUAD, join the sensational team of writer Steve Orlando and artists Ivan Reis and Joe Prado and discover how Batman assembled the roughest, toughest Justice League of all time!